Samba de roda (“Samba of roda”) is a traditional Afro-Brazilian dance performed originally as informal fun after a Candomblé ceremony, using the same percussion instruments used during the religious ceremony. The typical drum is the atabaque; drummers improvise variations and elaborations on common patterns, accompanied typically by singing and clapping as well as dancing. 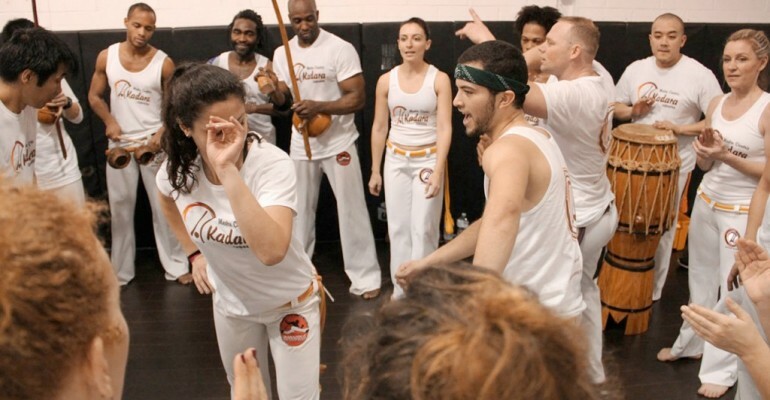 The Samba de Roda is a celebratory event incorporating music, choreography and poetry. The term ‘Samba’ encompassed many different rhythms, tunes, drumming and dances of various periods and areas of the Brazilian territory. It appeared in the state of Bahai, more specifically in the region of Recôncavo in Brazil, during the 17th century. Because all drumming and dance was generalized by Portuguese colonizers as ‘samba’, it is difficult to attribute it to one distinct heritage. However, the most universally recognized cultural origin of Samba is Lundu, a rhythm that was brought to Brazil by the Bantu slaves from Africa. Lundu reveals, in a way, the amalgamation of black (slaves) and white (Portuguese) and indigenous cultures. When the African slaves where imported, it was named the “semba” and with the introduction of the Arabic Pandeiro (tambourine), brought into the Roda by the Portuguese, the ‘Samba’ was molded into the form of dance it is now. In the indigenous language, “samba” means roda de dança, or a circle to dance since the indigenous peoples danced in celebration on many occasions, such as the celebration of popular Catholic festivals, Amerindian or Afro-Brazilian religious ceremonies, but was also practiced at random. All participants, including beginners, are invited to join the dance and observe as well as imitate. Usually, only the women dance after each other and they are surrounded by others dancing in a circle and clapping their hands. The choreography is often spontaneous and is based on movements of the feet, legs and hips. One of the most typical moves is the umbigada which is clear Bantu influence, where the dancer invites her successor into the circle’s centre. The factor that frequently draws the attention of most people to the rhythm is the unusually-accented (syncopated) beat. The absent beat is the strongest characteristic of Samba prompting the listener to dance to fill the gap with her/his body movements. This syncopated rhythm is also an indication of Black resistance against cultural assimilation. The Samba of Roda in particular was considered an expression of freedom and identity of the underprivileged and became a means of liberation. The Samba de Roda has significantly waned during the twentieth century due to economic decline and increased poverty in the region. The effects of mass media and competition from popular modern music have also devalued this tradition among the younger generation. Finally, the weakening of the Samba de Roda was heightened through the ageing of practitioners and demise of those who made the musical instruments.